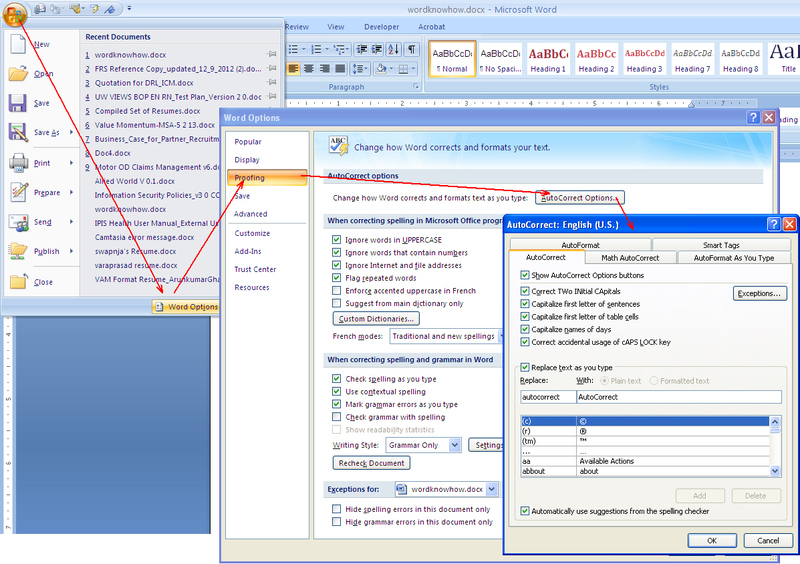 The AutoCorrect feature in Word saves a lot of time and effort if you use Word as a text editor. If your profession demands you to type a lot on a daily basis, you must have realized power of this feature by now. In this article, we will discover various usages of AutoCorrect and use them for our advantage. AutoCorrect works relentlessly behind the scene. Try typing “abouta” and then press the spacebar, Word automatically replaces this with “about a”, similarly “hte” with “the”, and there are so many. This happens because of the default AutoCorrect entries in Word. And, the good news is that you can edit these entries and add your own entries to make your work even faster. Alternately, you can stop AutoCorrect to work at all (if you really want to do so!). 1. Click the Office button and from the drop-down list, click Word Options. Word Options dialog box appears. 2. Click the category Proofing from the pane on the left. 3. From the pane on the right hand side, under the section AutoCorrect options, click the AutoCorrect Options button. The AutoCorrect dialog box appears. Tip: Or simply press the key combination Alt+T+A 🙂 This Word 2003 shortcut key still works…I am so used to it. 4. By default, Word opens the AutoCorrect tab. This tab contains a few check boxes along with the fields Replace and With. 5. To add an AutoCorrect entry, enter the correctly spelled word in the Replace field and the misspelled word in the With field. For example, enter “misspeled” in the Replace field and enter “misspelled” in the With field. Click OK.
To test, type “misspeled” and press spacebar, it will be automatically replaced by “misspelled”. So next time onward, don’t worry about a misspelled “misspeled”. If you are lazy enough (like me zzzz…) to type “AutoCorrect” every time instead of “autocorrect”, then enter “autocorrect” in the Replace field and “AutoCorrect” in the With field. Click OK.
As we know, if we misspelled a word while typing, Word underlines the word with a wavy red line. 2. From the right-click menu, under the sub-menu AutoCorrect, select the correctly spelled word from the suggestions. 3. AutoCorrect automatically saves this as an entry. Now if you type the incorrect word, AutoCorrect will replace this with the word chosen from the suggestions. You can stop it by un-selecting all the check boxes in the AutoCorrect dialog box and then click OK. I use AutoCorrect to insert standard text paragraphs (that I use repetitively) into my documents using simple keystrokes. This saves me from copying text from one document to another, writing the same content over and over, and so on. For example, following is the standard copyright text paragraph that we use consistently in our documents with minor changes here and there. 1. Select the paragraph and then click Alt + T + A. 2. The AutoCorrect dialog box appears with the selected text paragraph being copied into the With field. 3. Enter the shortcut word (may be “copyright”) in the replace field. Now, if you type “copyright” and press the spacebar, it would be replaced by the standard copyright text paragraph. You can use this technique in many different ways to insert images, logos, tables, etc. Posted on June 6, 2013 by wordknowhow •	This entry was posted in Uncategorized and tagged add autocorrect entry, delete autocorrect, edit autocorrect, stop autocorrect. Bookmark the permalink. Why oh why oh why did they get rid of the autocorrect option from the right click menu on the misspelled words? (it’s there in 2010 and then disappears from 2013 and 2016). Anyone know a way of getting it back? use the AutoCorrect feature in Word | MS Word Know How”. I personallymight absolutely end up being returning for a lot more browsing and commenting in the near future.